You know what they say, “If you mess with the bull, you get the horns.” While that phrase just remains a witty saying and we’re not sure if this bull was messed with per se, it’s clear that someone is getting the horns! 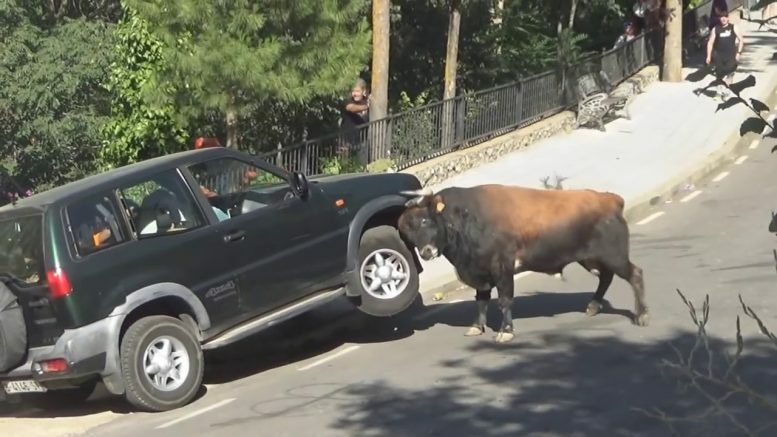 In this one, we check out the situation as the bull finds itself an SUV filled with a family and goes to town, ramming into the vehicle over and over again. We watch as the SUV begins to fall apart, taking some major damage from the animal as it won’t give up on destroying its target that it almost goes as far as flipping over. Check out the video below that shows the bull going to work on the truck as the family can do nothing but sit inside as they’re probably scared for their life!